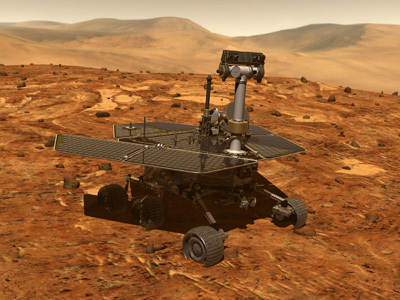 Today marks a huge milestone for NASA's Opportunity Mars rover: 9 years on the Red Planet. Not bad for a mission that had a 90-day design life. To date, Opportunity has driven over 22 miles across Mars, and, according to NASA, is still going strong, inspecting clay deposits at Endeavour Crater. For the record, clay tends to form in water of a neutral PH, which is very friendly to life. Personally, I think it's about time that the now 'other' rover got some limelight back. Launched for the Red Planet in 2003, a time which coincided with the closest Earth-Mars approach in thousands of years, Opportunity, along with its twin rover, Spirit, started their journey through space in the hopes of fulfilling a planetary scientist's dream of a large, long-lived, roving vehicle that was to serve as a mobile science platform. In the mission statement, Opportunity and Spirit were given a 90 day life estimate during which they would try to confirm the existence of water on Mars. That was at the rovers' arrival in January, 2004. Pathfinder/Sojourner, Viking, and all the other Mars missions. Needless to say, the rovers did not disappoint, with their findings completely reshaping our knowledge of the Red Planet. Speaking on Opportunity's unimaginable longevity, John Callas, project manager for opportunity at NASA's Jet Propulsion Laboratory (JPL), said that “these are magnificently designed machines . . . we really have greatly expanded the exploration envelope by having a vehicle that can not only last so long but stay in very good health over that time, such that we can continue exploring." Hopefully, Opportunity will live to celebrate many more anniversaries on Mars.